Centrally located townhouse. Close to shopping, recreation, transportation, and schools. Is within walking distance of TRU. Nice open design with lots of natural light. Kitchen and dining room area are open to living room below with high ceilings. Main floor lining room has French doors leading to the deck. 2 bedroom and 2 full 4 pc. bathrooms. There is potential to put a 3rd bed/den (where weight room is located). 1 covered parking spot (garage) and 2 outside parking spots. 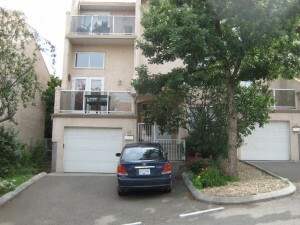 This is an end unit and is located in a quiet area of the complex. Pets and rentals are allowed. All appliances a/c unit and window coverings are included. Flexible possession and easy to show.